Regardless of anything, it is always polite to learn a few phrases in the local language before you go anywhere, and here a little goes a long way and locals will appreciate you giving it a try. Sometimes you get lucky and will meet a local with exceptional English speaking skills, in the month I was there, I met a total of 3. Do not expect people, even within the hospitality and tourism industry to speak English. Patience is necessary most of the time, often you will not get an answer to your question, so better to word it as simply as possible or just use body language. ‘Coconut? [point at coconut and show money note accompanied by confused facial expression]’ over ‘how much is a coconut?’. Me: so what is the difference between this and this? Me: is it 80 or 90? Do not mistake the misunderstanding for rudeness, it is quite the opposite, they are being polite and trying to help you, and the ‘yes’ is usually accompanied by a big smile on their face. Bargaining and haggling is still the way it’s done in Myanmar, the language barrier doesn’t help, but be patient. Write numbers on a piece of paper, have a map handy, do some research before getting into a haggling match and go in knowing exactly how much you should be paying for that peanut brittle (no more than 60Kyat for a small square ever fyi!). Do not misunderstand lack of english language skills for stupidity either. 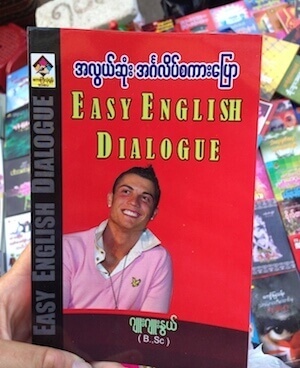 Myanmar people are highly educated. They are encouraged to learn and read books. 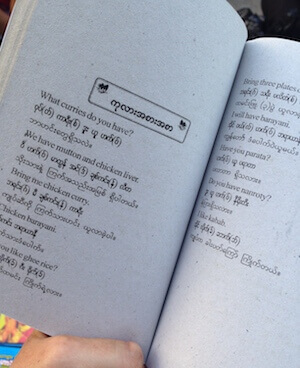 Our young guide during the trek in Kalaw, was teaching herself english from a re-printed diy english book. 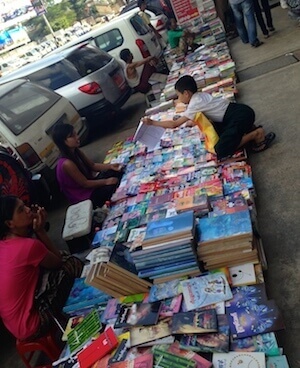 The streets of Yangon in particular are lined with book stalls selling all sorts of books from being able to learn English with Christiano Ronaldo, to Rudyard Kiplings story books, Delia Smith Cookery books, and even books that you think would be censored in such a country, detailing the modern history such as ‘A History of Modern Burma’. Most towns you visit will have at least one bookshop, even some of the more popular temples in Bagan have a bookstall amongst all the touristy crap selling stalls. Myanmar is an educated country with intelligent people, unfortunately, they are just not allowed or are too scared to speak a lot of the time. Don’t be that idiot that tries to force anyone to speak or asks stupid politics questions that they are not allowed to answer.